I just finished work on another interesting analog portable, the Sony Earth Orbiter CRF-5100. Many companies tried their hand at multi-band portables with such Globe-bounding names as Trans-oceanic, World Monitor…the CRF-5100 Earth Orbiter was Sony’s direct answer to Zenith’s Royal 7000 and R-7000 Trans-oceanics. The Sony is similar in size and facilities and as it turns out, is indeed very worthy competition. I have been a long-time lover of Zenith radios and have several, yet although the Zenith’s retain some unique advantages, the CRF-5100 has some advantages of its own…after we get ours working up to specs we’ll do some head-to-head comparisons so you can see just how they compare overall. The results surprised me! The CRF-5100 is an upgrade to the otherwise similar CRF-5090, the difference being the addition of the VHF Public service Band 147-174 MHz. These were made between 1975 – 1981 with an original MSRP of $200. Compare this to almost $300 for a Royal 7000 or R-7000. I was lucky enough to have two samples of the ‘5100 available to evaluate: The first belongs to a friend who wanted me to see it, check it out and tweak as needed, and the second I bought fairly cheaply because it was advertised as being dead on FM, Air and PSB. General Design: At first glance the ICF-5100 looks very similar in concept to the Zeniths and indeed has some design attributes of each. It actually has some of the best attributes of each but for this review I will generally be comparing it with the Royal 7000 which has proven to be a more reliable work horse and which was sold in far greater numbers. The CRF-5100 is all analog…it runs forever on 8 D cells or AC power with a built in AC power supply…it does however require an unusual Sony AC cord (pictured below). You could also use it in a car or boat with an optional Sony car power cord but these are almost impossible to find today. Battery life is so good with today’s alkaline or rechargeable D cells it shouldn’t usually be a concern. All the usual controls and features are present including side-mounted band selector rotary knob, Volume & Tone controls, BFO, variable RF Attenuator, Squelch For Air & PSB, main tuning and concentric fine tuning knobs, signal meter, a very cool Red LED signal strength/tuning indicator right in the dial pointer, earphone jack, momentary light switch (the lights stay on full time when operating on AC power), On/Off toggle and an FM AFC On/Off toggle. 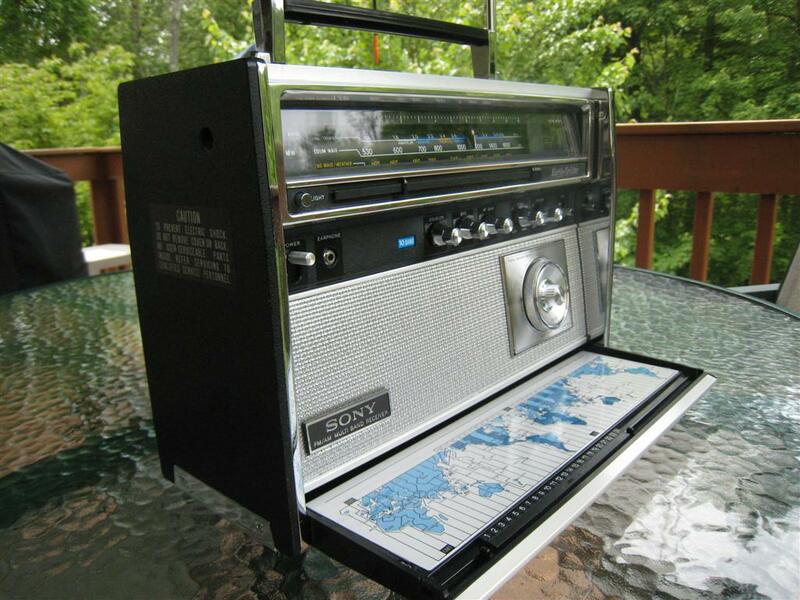 The set features an impressive 8 inch ferrite rod for AM and LW, a 50 inch whip for all other bands, external antenna terminals, a wide range 4 x 6 speaker, World Time Zone map with adjustable time calculator and a fold down front panel cover. There are also 5 little dial markers which you can slide around beneath the dial window to help in quickly locating specific frequencies. There is a rotating drum dial/band selector switch on the right side similar to the Zeniths. There is only one bandwidth available on the Sony. 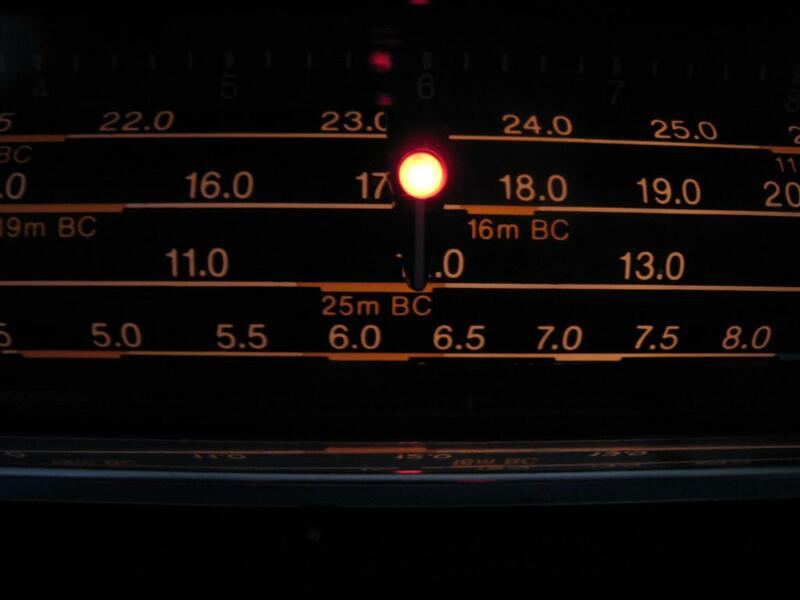 As is often the case coverage extends well beyond these limits on all bands so there is considerable overlap…for example the AM band is spec’d at 530 – 1605 KHz but the factory alignment limits are 520 to 1680 KHz. The radio is a single conversion design and does show some unwanted out of band images which we will discuss in more detail. 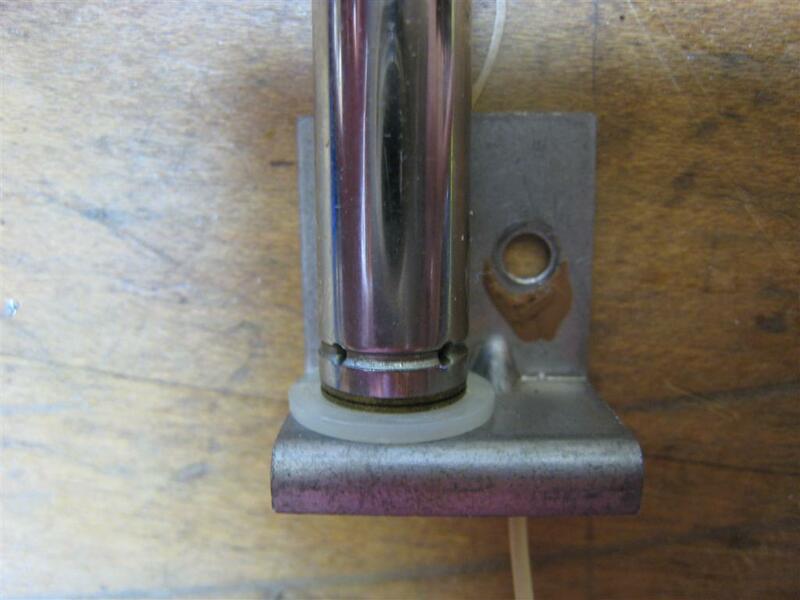 Buying a CRF-5100: One defect you want to look out for and avoid is a warped drum dial…although it can be repaired it is quite a project and not something most people will be able to accomplish. Martin Cook has sent me details of how he did just that and you can read about how he did it here. 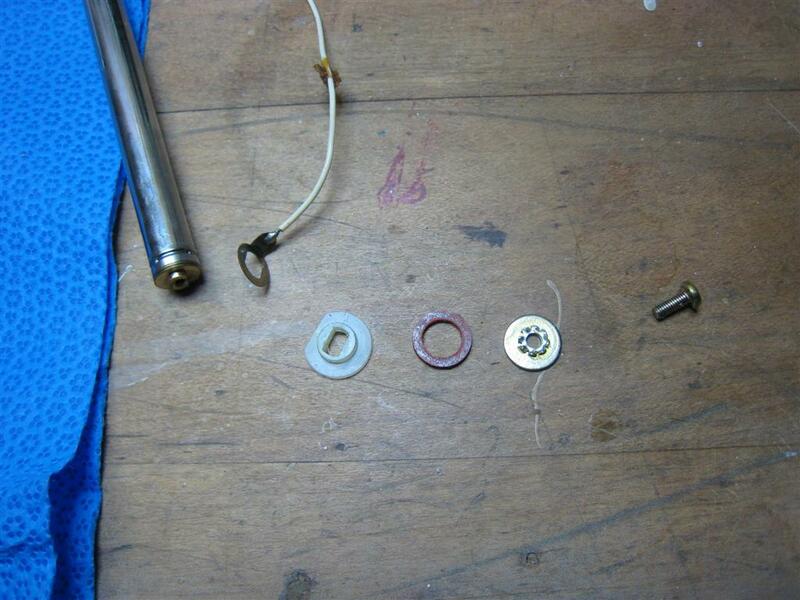 If subtle it is only a cosmetic issue but if warped badly it can prevent the drum from moving properly. I don’t know why they warped…maybe they cannot take direct sunlight…or perhaps if the radio is operated on AC with the lamps always on their heat caused the warpage. I will be careful to avoid that with mine. 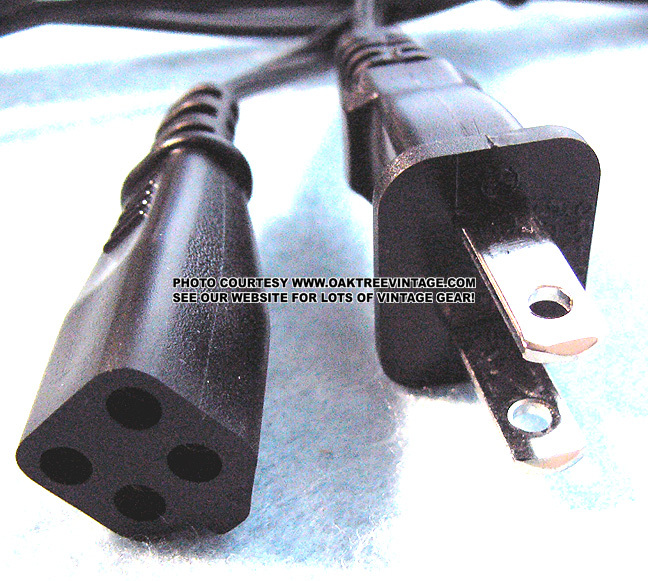 Missing AC Cord – If you need AC operation be sure your set comes with the correct cord. These are hard to find and generally sell for around $35 when they do show up on eBay. Sony used this plug design for a few years in the late 70’s and early 80’s on a wide range of equipment. Dents in front cover chrome strip and scratches in chrome around tuning knob – evidently the chrome was vulnerable in these spots. It’s a cosmetic issue only and generally not bad for a daily player radio. But if you are looking for a really minty unit, they’re much harder to find. Improperly Assembled Whip Antenna Mounting Bracket – After seeing this on both of the radios at hand I recommend you check for it if your radio is working improperly or erratically. Evidently many people have made this mistake. The funny part is that it is not necessary to disassemble this bracket in the first place. All you do is unsolder the whip’s lead wire from the PCB and the whip and it’s mounting bracket assembly come out in one piece, but evidently some people take the assembly apart instead – presumably so they don’t have to solder – then they don’t pay close enough attention to putting it back together properly. If you don’t put it together correctly the whip can short to the bracket causing intermittent or no signal from the whip. Routine Repairs: Beyond removing the back panel do not try to open one of these up without the Service manual! Although the amount of disassembly necessary for routine repairs is not that difficult, you need to know a few very specific tricks which you would be unlikely to figure out without the book. 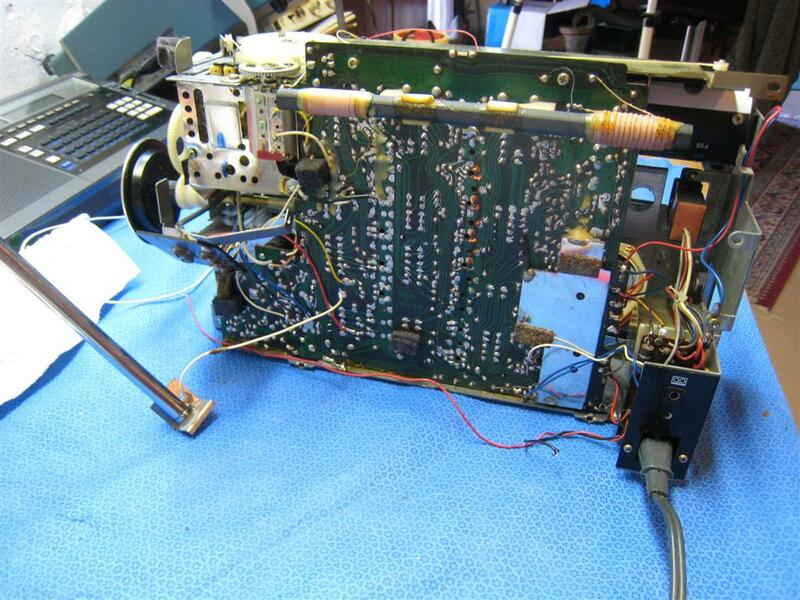 Some of the further disassembly steps get pretty involved though…hopefully you won’t have to go that far. Luckily neither of the 5100’s in front of me needed difficult repairs. My friend’s radio seemed pretty dead on SW when I first tried it. That turned out to by two things. First some very erratic front panel controls, solved with typical control cleaning (I recommend De-Ox-It). Use extreme care with this. 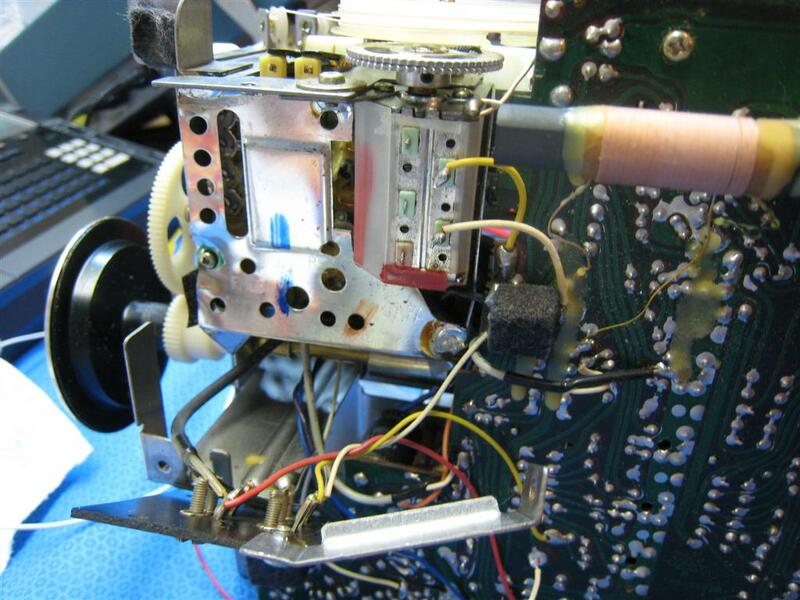 Unless you want to do much more disassembly you will have to get some cleaner into those controls in place. This means you will probably want to turn the radio upside down to shoot down into the controls with a clear view, which will place the dial drum directly beneath them…an invitation to disaster. I was about to tackle the additional disassembly but found a decent shortcut. I stuffed several thicknesses of paper towel between those pots and the dial drum and was very careful to use only the shortest of sprays. The controls all cleaned up perfectly and not a single drop even hit the paper towels. Be sure you check for drips and clean up with alcohol if needed. 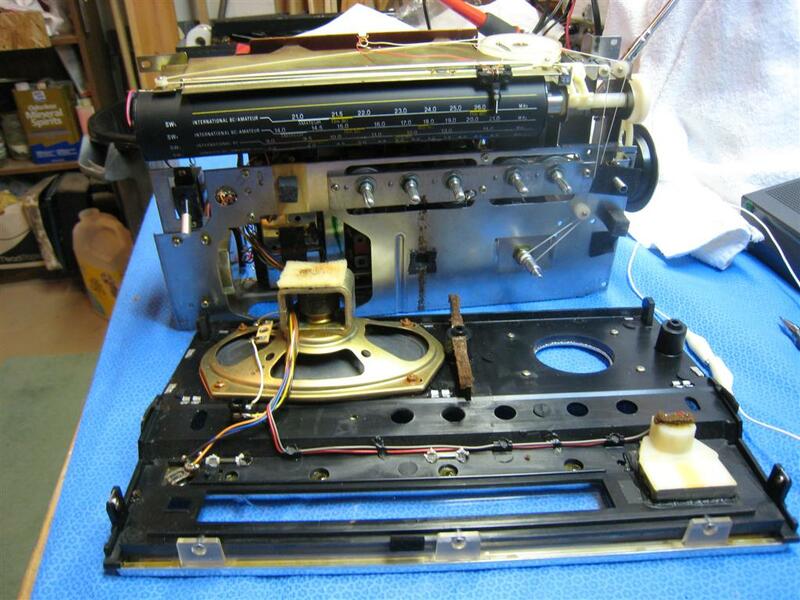 I aligned the radio and found it to be working very well, yet after I re-assembled it the SW was again completely dead…nothing. It would static in and out as I moved the radio. Taking the back off I soon discovered the whip antenna was shorting to the chassis because of that improperly assembled mounting bracket I discussed earlier. I re-assembled it properly and the set was now working properly. My set, in addition to the above issues, was also dead on FM, PSB and Air. Nothing. That turned out to be a very simple fix. In addition to the primary band selector switches which are quite difficult to access, there are two additional vertically-oriented slide switches for these three HF bands, and they are very visible and easy to get to for cleaning. 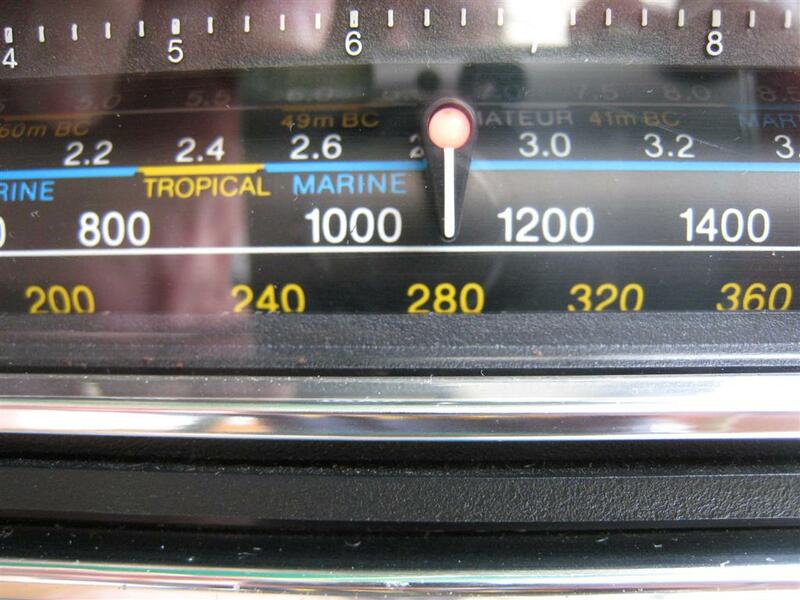 These are known trouble spots on these radios whereas the primary band switches are not. All bands restored, I aligned the radio, fixed its whip antenna mounting bracket was also assembled incorrectly (and mine was missing one important washer) and put it back together. For the first tests I pitted the Sony against my Zenith T/O Royal 7000 which was the subject of a previous restoration article…the Royal 7000. I was not prepared for how well the Sony would acquit itself against the Zenith, especially on SW.
On AM the Sony was at least as sensitive as the Zenith across the whole dial and at the band extremes the Sony was noticeably more sensitive…a few weak signals at the very bottom and top of the dial sounded considerably stronger and clearer on the Sony. Most signals over most of the dial were much closer on the two however. 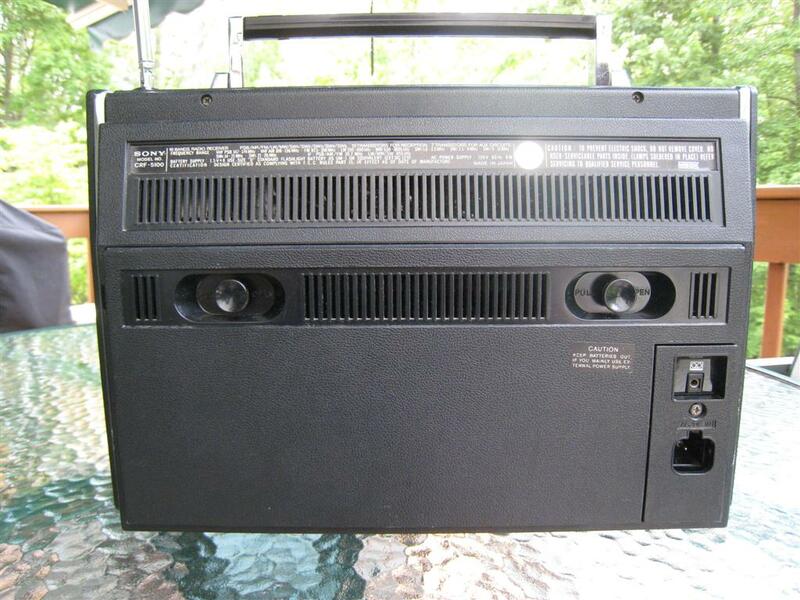 On SW in the daytime the Sony almost matched the Zenith but on some signals the Zenith still held the sensitivity edge. Not surprising with its huge waverod antenna which towers over the Sony’s shorter whip. 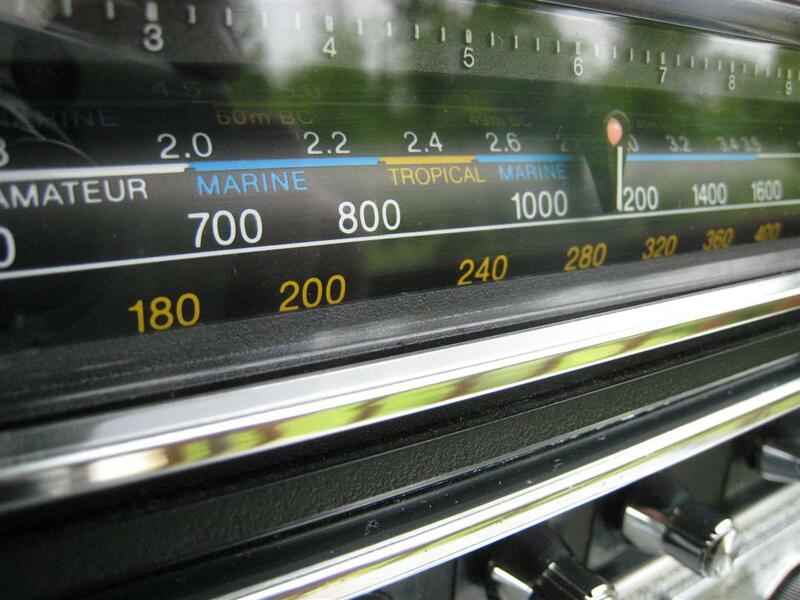 The Royal 7000, with its spread bands certainly made it easier to locate specific frequencies, as most of the SW bands are compressed to less than an inch on the Sony (see photo)…an attribute common to all general coverage (non-spreadband) designs. I then compared my Grundig G5 and G3 radios which are approximately equal to each other on SW sensitivity as a reference point but they were nowhere near as good as the Zenith or Sony. Then I thought to try a 20 foot wire on the radios clipped to their whips. The Zenith and Grundigs improved quite a bit but the Sony did not…in fact it seemed to become noisier even though signal levels were higher…evidently it is well matched to its whip and the additional signal didn’t help yet it seemed to add additional spurious noise. After trying a few different antennas on the Sony and the Zenith I concluded that the Sony’s design relies on higher gain at the whip antenna input so it does very well in terms of sensitivity with a relatively short whip but if you add too much antenna to it, the front end may be susceptible to overload. At night the Sony did very well…it was able to pull signals almost as well as the Zenith but this was not terribly surprising…at night, raw sensitivity is not quite as important as it is in the daytime and other factors come more into play. For example the Zenith’s spread bands are a joy compared with the Sony’s more crowded dial, but still…the Sony’s performance has to be considered very good. The Sony does have some problems with false images and as a friend helpfully pointed out they are generally 910 KHz (twice the 455 KHz IF frequency) below the real signal. Luckily this means the nastier images tend to fall outside the SW broadcast bands, but if you are tuning between bands, you will find images which you may easily mistake as real stations. I think this slightly sub-par image rejection can also lead to a general increase in background hash in some cases…it may be why the CRF-5100 did not like to have a 20 foot wire clipped to its whip. For most SW listening it is not likely to be a deal-breaker…just something to be aware of. You can always shorten the whip somewhat or try the RF Gain control if you think you are having this kind of problem. SSB: Neither of these radios are a good choice for serious SSB listening. As with most analog portables, SSB tuning, although present, is touchy to tune in initially and keep tuned in for best sound. You can do it and it’s fun sometimes, but for day in/day out SSB listening a more modern PLL digitally tuned radio can be far superior. On FM both radios offer reasonable reception of typical FM signals…neither are FM band DXers but both are good enough that you should have no trouble with routine FM listening. PSB/Air Bands: I consider these bands as an added bonus because what you are likely to find to listen to on them will be hit or miss depending on your area and when you listen. I was able to hear a bit though from local air traffic to the local NOAH Weather station, the local Ham repeater…even a local police department which was a surprise. Sensitivity is mediocre on these bands (several weather radios I have pull in the local weather station better) but if you are so inclined there’s no telling what you might stumble across. My Zenith is less sensitive on the weather band frequencies as well. Conclusion: The Sony CRF-5100 has become an interesting addition to my radio arsenal. It is a worthy competitor to the Zenith Royal 7000 and R-7000 overall even if the Zeniths do have some superiorities such as dual bandwidths, better image rejection and slightly better sensitivity. Although I do have other radios which outperform the CRF-5100, especially with external antennas, nevertheless, as a portable radio, the 5100 is a very good performer and a joy to use. I especially like the combination of the Red Tuning LED Indicator built right the dial pointer…it gives an excellent visual indication of signal strength and proper tuning, in addition to the nice-sized signal level meter. The Fine Tuning control, a small knob within the larger main tuning knob is a great help for critical tuning, especially on SW. 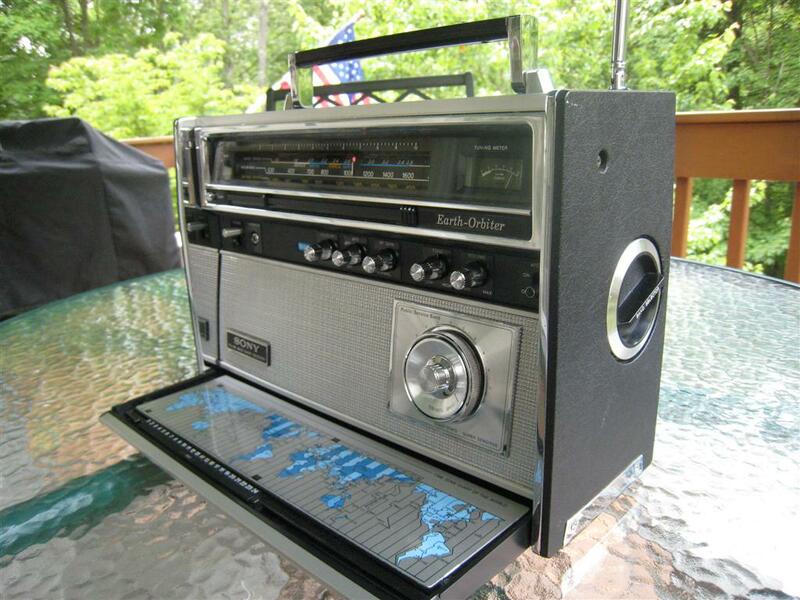 The radio has a nice feel and it very easy to use. Remembering also that the Sony cost $100 less than the Zenith’s when new I think it is safe to say that Sony hit a home run with the CRF-5100!